As I researched and wrote Walking Washington’s History: Ten Cities, I knew that local historians would know much more about their cities. I relied on their written work, talked and walked with many of them, visited local libraries and historical societies and hoped for the best. As Dean Kahn of The Bellingham Herald wrote with insight, “summarizing local history goes quickly while researchers’ work clarifying and correcting history is a much slower process.” An error can easily become part of the historical record, repeated without further research by historians and writers down the line. Such an error is the source of the bricks that built the Richards and Company Building in Bellingham. These aren’t ordinary bricks but the longest lasting bricks in a building in the state. 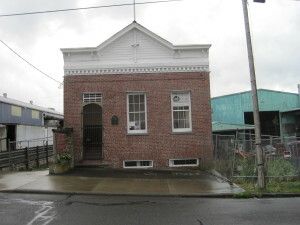 Constructed in 1858, the warehouse and store catered to several thousand miners who were camped in Bellingham waiting for construction of a trail to the Fraser River gold rush. I wrote that the bricks were “shipped as ballast in ships from Philadelphia around Cape Horn through San Francisco.” Search the Internet and you will find this “fact” stated many places: the Legacy Washington project on the Secretary of State’s page, in HistoryLink, on the City of Bellingham website, and on the Whatcom County Historical Society website. I’m in good company here. The permanence of this very brick, however, has provided time for more research. A study of the bricks made during a Save Our History project discovered that the bricks were manufactured in San Francisco and shipped to Bellingham on the bark Ann Parry. The evidence? In the spring of 2012 the bricks were matched to a fragment of Nagel brick, made by a brick maker of that name in San Francisco. A good description of this discovery is on the website of the Whatcom County Historical Society. One piece of history has been clarified by good research, and the updating begins.